For the British jazz guitarist of the 1950s, see Malcolm Mitchell (musician). Malcolm Jarod Mitchell (born July 20, 1993) is a former American football wide receiver. He was drafted by the New England Patriots in the fourth round of the 2016 NFL Draft. He played college football at the University of Georgia. A graduate of Valdosta High School in Valdosta, Georgia, Mitchell played at the University of Georgia from 2011 to 2015 under head coach Mark Richt. In 2011, as a true freshman, Mitchell was a Freshman All-SEC. On October 8, against Tennessee, he recorded a season-high 126 receiving yards in the 20–12 victory. He caught 45 receptions for 665 yards (14.8 average) with a long of 71 yards and four touchdowns. Mitchell missed three games with a hamstring injury, but still finished fourth in the SEC in receiving yards per game. In 2012, during his sophomore season at Georgia, he played in 13 games making nine starts, and was second on the team with 572 receiving yards on 40 catches and played on defense through the fourth game of the season. On October 20, against Kentucky, he recorded 103 receiving yards in the 29–24 victory. Mitchell was the recipient of the Charley Trippi Most Versatile Player award. Mitchell practiced at cornerback and spent time there throughout spring practice as well. In 2013, Mitchell redshirted after tearing his ACL in the first quarter of the first game of the season against Clemson. In 2014, Mitchell played in 8 games, making only 3 starts and caught 31 passes for 248 yards; he won the team's Comeback Player of the Year award. In 2015, as a redshirt senior, Mitchell started all 13 games and was named an offensive captain. Mitchell caught 58 receptions for 865 yards (14.9 average). On September 19, against South Carolina, he recorded 122 receiving yards and a touchdown. In the final game of his collegiate career, in the TaxSlayer Bowl against Penn State, he recorded 114 receiving yards and a touchdown. Off the field, Mitchell earned the David Jacobs Award, given annually to the player who best portrays courage, spirit, character and determination; the Haier Achievement Award, the SEC Community Service Team, and the 2016 Community Spirit Award. When he graduated, he ranked third in school history with 174 receptions for 2,350 yards and 16 touchdowns. Mitchell was selected by the New England Patriots in the fourth round (112th overall) of the 2016 NFL Draft. He was the 11th wide receiver selected. On May 5, 2016, the New England Patriots signed him to a four-year, $2.91 million rookie contract that included a signing bonus of $577,992. Head coach Bill Belichick named Mitchell the starting wide receiver, alongside veteran Julian Edelman. Mitchell made his professional regular season debut and first career start in the New England Patriots' season-opener against the Arizona Cardinals and caught two passes for 33 yards from Jimmy Garoppolo. On November 20, 2016, Mitchell caught his first career touchdown reception from Tom Brady, a 56-yard score in a victory over the San Francisco 49ers. He finished the game with four catches for 98 yards, and one touchdown. A week later, at the New York Jets, Mitchell had his first two-touchdown game, catching five passes for 42 yards and two touchdowns. On December 4, 2016, Mitchell caught a season-high eight passes for 82 yards in a 26–10 victory over the Los Angeles Rams. Mitchell finished his rookie season with 32 receptions for 401 yards and four touchdowns in 14 games and six starts. On February 5, 2017, Mitchell was part of the Patriots team that won Super Bowl LI. In the game, he caught six passes for 70 yards as the Patriots defeated the Atlanta Falcons by a score of 34–28 in overtime. He caught all five targets from Brady in the pivotal fourth quarter, and converted four of those five receptions into first downs. On September 7, 2017, Mitchell was placed on injured reserve due to a knee injury. With Mitchell not playing the whole season, the Patriots reached Super Bowl LII, but lost 41-33 to the Philadelphia Eagles. Throughout the offseason, Mitchell had been dealing with issues with his knee, and underwent a knee procedure in July. On August 6, 2018, Mitchell was waived by the Patriots. On March 23, 2019, Mitchell announced his retirement, citing knee issues. Mitchell was not a strong reader when he began college, then reading only at a third grade level, but grew to love reading; even joining a woman's reading club and promoting literacy among youth. He is more proud of his reading accomplishments than of making it to the Super Bowl. In 2016, Mitchell released his first book, The Magician's Hat. This children's picture book features David, the Magician, who loves to perform magic. David knows the magical power of books, which can explore dreams and develop creativity. ^ "GEORGIADOGS.COM - Malcolm Mitchell Bio - University of Georgia Official Athletic Site". www.georgiadogs.com. Retrieved May 4, 2016. ^ "Georgia at Tennessee Box Score, October 8, 2011". College Football at Sports-Reference.com. Retrieved December 25, 2017. ^ "Malcolm Mitchell 2011 Game Log". College Football at Sports-Reference.com. Retrieved December 25, 2017. ^ "GEORGIADOGS.COM - Malcolm Mitchell Bio - University of Georgia Official Athletic Site". www.georgiadogs.com. Retrieved February 14, 2017. ^ "Malcolm Mitchell 2012 Game Log". College Football at Sports-Reference.com. Retrieved December 25, 2017. ^ "Georgia at Kentucky Box Score, October 20, 2012". College Football at Sports-Reference.com. Retrieved December 25, 2017. ^ "Georgia WR Mitchell has surgery to fix ACL". ESPN.com. Retrieved December 25, 2017. ^ "Malcolm Mitchell 2014 Game Log". College Football at Sports-Reference.com. Retrieved December 25, 2017. ^ "Malcolm Mitchell 2015 Game Log". College Football at Sports-Reference.com. Retrieved December 25, 2017. ^ "South Carolina at Georgia Box Score, September 19, 2015". College Football at Sports-Reference.com. Retrieved December 25, 2017. ^ "TaxSlayer Bowl - Penn State vs Georgia Box Score, January 2, 2016". College Football at Sports-Reference.com. Retrieved December 25, 2017. ^ "Malcolm Mitchell Georiga Bio". Georgia Dogs Football Bio. Retrieved August 17, 2016. ^ "Malcolm Mitchell". New England Patriots. Retrieved May 4, 2016. ^ "Malcolm Mitchell Combine Profile", NFL.com, retrieved July 31, 2016 . ^ Reiss, Mike (April 30, 2016). "Patriots hope to buck struggles developing WRs, pick Malcolm Mitchell". ESPN. Retrieved April 30, 2016. ^ "Sportrac.com:Malcolm Mitchell contract". Sportrac.com. Retrieved November 23, 2016. ^ a b "NFL Player Profile:Malcolm Mitchell". NFL.com. Retrieved November 22, 2016. ^ "New England Patriots at Arizona Cardinals - September 11th, 2016". Pro-Football-Reference.com. Retrieved December 25, 2017. ^ "Patriots vs. 49ers - Game Recap - November 20, 2016 - ESPN". ESPN.com. Retrieved November 21, 2016. ^ "Malcolm Mitchell: Career Stats at NFL.com". www.nfl.com. ^ "Patriots place WR Malcolm Mitchell (knee) on IR". NFL.com. September 7, 2017. ^ Patra, Kevin (August 7, 2018). "Patriots release wide receiver Malcolm Mitchell". NFL.com. ^ Smith, Michael David (March 23, 2019). "Former Patriots receiver Malcolm Mitchell retires". Pro Football Talk. NBC Sports. ^ Dodd, Dennis (July 16, 2015). 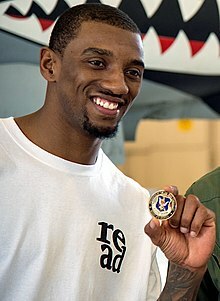 "Georgia WR Malcolm Mitchell proves reading is fundamental, impactful". CBS Sports. Retrieved February 6, 2017. ^ Hartman, Steve (February 3, 2017). "Patriots wide receiver's proudest achievement isn't making the Super Bowl". CBS Sports. Retrieved February 6, 2017. ^ "The Magician's Hat". Read With Malcolm. Retrieved May 4, 2016.